This Rwanda vacation package explores the Lake Kivu, Gisenyi where one is able to participate in the Congo Nile Trail, have a boat ride on the lake and relax by the beach for a perfect Rwanda beach holiday. The tour package starts with many lifelong dream of trekking gorillas in Volcanoes National Park of Rwanda. This is a luxury gorilla and lakes tour staying at the luxurious lodges like Mountain Gorilla view Lodge and the 5 star Serena Hotels in Kigali and Lake Kivu. This Rwanda gorillas and Rwanda Chimps tour is primarily for visitors making trips to Rwanda and wish to exclusive trek Rwanda's primates in Nyungwe and Rwanda's mountain gorillas in Volcanoes National Park. What a better way to enjoy the best of both worlds. Very few holiday tours focus on just Rwanda Chimps and Rwanda gorillas. You will find that most journeys combine either gorillas with the lakes or Akagera with the gorillas or simply Nyungwe chimps alone with a night's stay on the shores of lake Kivu in Kibuye. The Rwanda tour starts with a tour of Kigali city on day one of your holiday safari. We visit a genocide memorial site in Gisozi, shop for some crafts and visit the Kigali museum, before travelling to Nyungwe Forest with a stop-over in Butare to visit the King's Palace at Nyanza and a museum. We later arrive at Nyungwe Forest where the tour package allows you to track the chimpanzees, do a canopy walk and the Colobus Monkeys. The safari then takes us to Kibuye for a relaxing day on the shores of Lake Kivu. 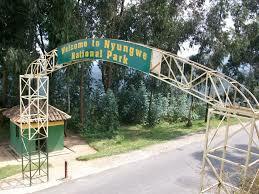 It is from here that the tour then takes us to Volcanoes National Park via the lakeside town of Gisenyi. The tour saves the best for last. The ultimate dream of trekking the mountain gorillas in their natural habitat. Armed with your gorilla permits as souvenirs, the tour returns us to Kigali for your flight back home. This package is all about Rwanda's chimps in Nyungwe, Rwanda's mountain gorillas, with Rwanda's lakes, history, culture and nature walks sprinkled in between. You will be met on arrival at Kigali airport by our tour driver/guide for the tour while in Kigali. You will be briefed about your holiday safari with details of the trip flow, activity schedule, accommodations etc. Any questions you may have will be addressed. We will then conduct a tour of Kigali city where the history and current developments of Kigali will be explored. Kigali is the economic and financial hub of Rwanda. Kigali has a rich history and is surrounded by beautiful hills and perhaps one of the cleanest city environs in Africa. You will simply be amazed. Perfect gateway for what we hope will be an amazing 6 days with us on the chimps and gorillas tour of Rwanda. While on the Kigali city tour we shall visit the genocide memorial in Kigali, a very moving testimony of Rwanda's un-flattering past. After lunch, the road leads South of Rwanda to Butare the former capital city of Rwanda and educational hub that hosts Rwanda's leading intellectual institutions of higher learning. The tour holiday is scheduled to stop over enroute to visit the King's Palace in Nyanza, an art museum before we proceed to Nyungwe Forest National Park for our chimpanzee trekking expeditions. Nyungwe Forest is famed as the only travel destination in the world where one is able to see up to 13 primates species in a solitary location. The primates species to be found here include, angolan colobus monkeys, white colobus monkeys, the chimpanzees, the blue monkeys and the L'hoest's monkeys. The populations and concentrations of the habituated primates stands at a staggering number of over 500 primates in some troops of chimps and monkeys. 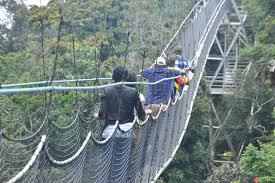 We check into your lodge and later in the afternoon go for canopy walk. You will hike through thick rain forests, expansive green tea plantations and enjoy magnificent views of this pretty part of Africa . Diner and overnight at: Nyungwe Forest Lodge or Gisakura Guest House. Day 2: chimpanzees tracking in Nyungwe Forest. After breakfast you report to Nyungwe park head quarters for pre chimp trekking briefing. You will proceed to the forest in search of the chimpanzees. You later return to the lodge for lunch and in the afternoon immerse yourself in either of the options activities like canopy walk, tea plantation expedition learn hoe tea is harvested and visit local factory, you will be able to taste some of the best freshly prepared tea. Day 3: Morning transfer to the shores of Lake Kivu- Kibuye. in morning, we depart Nyungwe Forest National Park for the equally exciting destinations ahead of us on this tour of Rwanda. We depart Nyungwe and head to Kibuye a beautiful rather calming town bang on the shores of Lake Kivu. Lake Kivu is regarded as one of Africa's great lakes and the 6th largest lake in Africa. Rwanda is currently prospecting for commercial natural gas in Lake Kivu. There is plenty of activities on the lake including boat rides, dug- out canoe cruises etc. Diner and overnight at: Moriah Hills Resort. we transfer to Volcanoes National Park via another beautiful lake side town of Gisenyi. We drive through beautiful lush green countryside and expansive tea and sometime coffee plantations. You will meet local Rwandans on the way going about their daily economic activities. We anticipate to stop in Gisenyi for lunch, where you may spend a few hours relaxing on the tropical beach on the shores of Lake Kivu. In the afternoon we embark on a 1.5hrs transfer to Volcanoes National Park. Day 5: Gorilla Trekking in Volcanoes National Park Rwanda. After a very early breakfast your driver guide will transfer you to the park headquarters for gorilla trekking briefing. You will be assigned into groups of 8 and allocated a gorilla family/group to trek. Once the trek is completed and you have met the gorillas, you will return to the base of the mountains. Your tour guide will return you to the lodge for lunch. Afterwards you may choose to relax at the lodge, take a guided walk to Ruhengeri local market where you get an opportunity to purchase local artcrafts, Rwandan fabrics, local foods, Rwandan coffee, and souvenirs. Alternatively, we shall visit the spectacular twin Lakes, of Lake Burera and Lake Ruhondo and enjoy the great views of the Virunga mountains and volcanoes chain. After breakfast, we embark on a leisurely 2.5hrs transfer back to Kigali. If we did not have the chance of doing the Kigali city tour on day of arrival, same will be conducted on this day including a visit to the genocide memorial at Gisozi. We later transfer to the airport for your outbound departure flight.